The Hare and Tortoise may not be much to look at but don't let that put you off. With their extensive menu of Japanese and Oriental dishes you'll certainly be spoilt for choice. 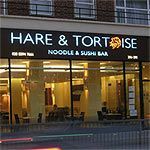 Nothing to do with the fable, Hare & Tortoise is a cool little noodle bar. Great for students as it’s dead cheap and the service is friendly. Nice one Hare & Tortoise! I really should be working but it is far easier to wax lyrical about the Hare and Tortoise restaurants. I have eaten at two, Ealing and Putney. Both times lunch was served promptly with no fuss. The sashimi was delicious; blue fin tuna and the noodle dishes are both generous and tasty. H&T offers great value for money and I'll be going back! With a name that’s more reminiscent of a traditional English pub than a noodle bar, this storybook restaurant should have Wagamamas looking over its shoulder. Hare and Tortoise isn’t a restaurant that’s been swept away with looking good, offering a very simple, minimalist and almost clinical design. The venue is more or less off-white with a few splashes of red and black with an open-plan kitchen, while the tables and chairs could be reminiscent of something you’d find at McDonald’s. Don’t let this put you off however as while its looks might not be particularly memorable, the food certainly is. Relaxed dining that’s no frills or fuss, it’s no wonder this one is so popular with locals. Crammed with people from all spectrums, with couples, families, large groups or friends just catching up over a bite, expect a steady flow of diners at lunchtime, while things tend to get busier at dinner. Food is served quickly while the staff can vary from super-friendly and helpful to more reserved and clinical, perhaps to match the decor. Whether you’re after a hot meal or some cold sushi rolls you won’t be disappointed. The curry laksa not only tastes superb, but is absolutely huge. Priced at under £6, it’s a steamy bowl of noodles mixed with spicy tofu, seafood and chicken. The tori katsu curry is another favourite, made up of crumbed chicken served with a creamy Japanese sauce on a bed of steamed rice – also costing around £6. On the sushi front, the dragon rolls are highly recommended, an inside out seaweed roll with crispy tempura prawn filling. If you really want to get stuck into it, throw your chopsticks away and chomp down on one of the oh-so-moreish hand rolls that come in a number of variations including salmon, tuna, eel and soft shell crab. Giving into temptation is just too easy with the handful of Japanese drinks on offer. Sake, plum wines and a fruit liqueur made from the stone of the ume fruit make offer a more interesting choice than just the standard wine and beer. For those who do want to stick to the familiar, beers are of the Asian persuasion with Kirin, Asahi, Tiger and Tsing Tao. The wine selection isn’t very big but there’s enough on there to get you by, with the staple grapes on offer including cab sav, sauvignon blanc and pinot grigio. Bottles range from around £10 to £22. The decor may not be anything to write home about but you’ll get lost in the menu, Hare and Tortoise offers up fab food for a fab price. Definitely worth a visit.